From 29 August 1796, her married name became Dundas. After her marriage, Anne Huck-Saunders was styled as Viscountess Melville of Melville on 29 May 1811. He held the office of Member of Parliament (M.P.) (Tory) for Rochester between 1826 and 1830.1 He held the office of Member of Parliament (M.P.) (Tory) for Winchelsea between 1830 and 1831.1 He was appointed Companion, Order of the Bath (C.B.) 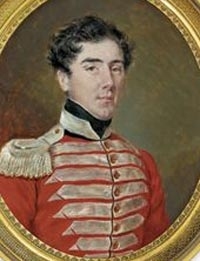 in 1839.1 He held the office of Aide-de-Camp to HM Queen Victoria in 1841. He held the office of Aide-de-Camp to HM Queen Victoria between 1841 and 1842.1 He fought in the Second Sikh War in 1849.1 He was appointed Knight Commander, Order of the Bath (K.C.B.) in 1849.1 He succeeded as the 3rd Viscount Melville of Melville, co. Edinburgh [U.K., 1802] on 10 June 1851.1 He succeeded as the 3rd Baron Dunira, co. Perth [U.K., 1802] on 10 June 1851.1 He held the office of Governor of Edinburgh Castle between 1855 and 1860.1 He was Colonel of the 100th Foot between 1858 and 1862.1 He was Colonel of the 32nd Foot between 1862 and 1863.1 He was Colonel Commandant of the 60th Rifles between 1863 and 1876.1 He was appointed Knight Grand Cross, Order of the Bath (G.C.B.) in 1865.1 He gained the rank of General in 1868. He was appointed Knight, Order of the Btah (K.B.) in 1870. Children of Clementina Holloway and Admiral Sir Robert Waller Otway, 1st Bt. Rt. Hon. Sir Arthur John Otway, 3rd Bt.